Sarah Ferguson, the Duchess of York, has officially opened a new multimillion-pound cancer unit in Southampton. 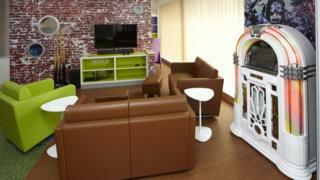 The £2.4m 10-bed facility at Southampton General Hospital has been funded by the Teenage Cancer Trust. It has been offering specialist treatment to people aged 16 to 24 from the South of England and the Channel Islands since September. Roger Daltrey, lead singer of The Who, pulled out of the event due to illness. Facilities at the unit - which has taken eight months to build - include six inpatient en-suite bedrooms, four day care beds, a large social room and a 24/7 kitchen area. A trust spokeswoman said many of the unit's features were designed by young cancer patients, alongside the hospital architect. "Around 100 young people are diagnosed with cancer across Hampshire, Dorset, the Channel Islands, South Wiltshire, the Isle of Wight and West Sussex each year," she added. "Being treated alongside others their own age by experts in teenage and young adult cancer care, can make a huge difference to a young person's experience." The charity said just over £1,000-a-day needs to be raised to maintain the unit, fund specialist staff and support free cancer awareness sessions in the region.